Let me start this out by saying this is the declutter I hated the most. There's almost nothing worse than sorting old papers. Or new papers. Or papers in general. I just hate it. But on the other hand, that's a good reason to do it. So I can get the package out of my life, not weighing me anymore. But seriously, I really don't want to do this. Not that I don't like having less unnecessary stuff but I just hate paperwork a lot. Surprisingly, when I finally started, I didn't have as many things to sort out as I thought. Sure, I had old invoices to rip and some other not necessary papers, but I had done a pretty good job sorting them before. The work wasn't as overwhelming as I thought. Which is good. 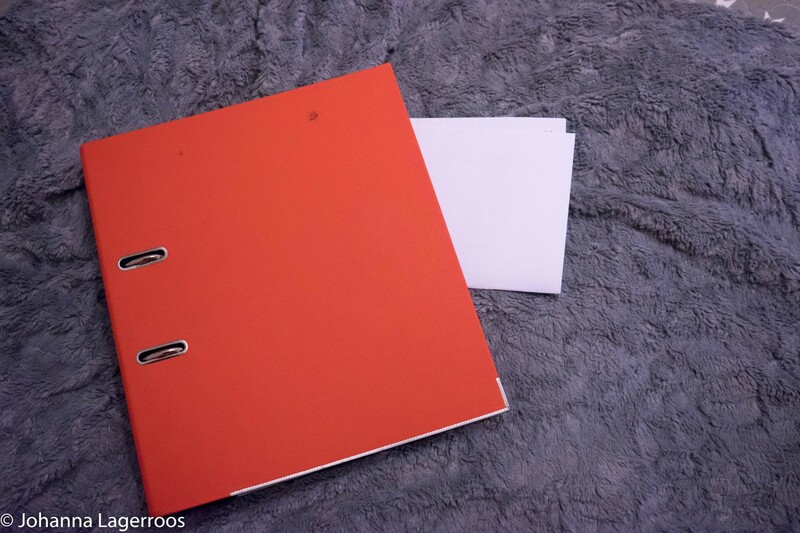 I do have a couple of folders for the important papers; one for my personal documents and one for the papers both of us might need. My personal one was in bigger need of cleaning as it truly had things I'll never need again so I just threw them away and ripped them up a bit so no one can go snooping in them, my prior addresses etc. Notebooks are one of the problem things in my life. I love writing things down a little too much, and it results on me having so many. I think once I have my thesis done and then some, I can put away some of them because I can be sure I won't need the notes - and if I do, I can google or otherwise research the same info. 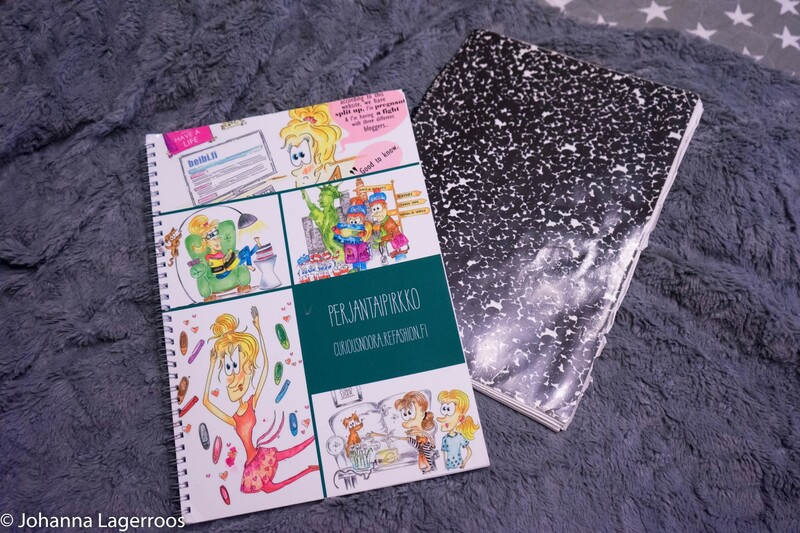 But some of them include my short stories, diary entries and more personal things I won't be parting with simply because they fun and cringey to check out every once in a while. Especially the wannabe sassy ones from my teenage years. Oh lord. Rule of thumb when decluttering papers: Most things can be stored online/digital rather than in print, so try to get as much as possible digitalized, and the important ones backed up in couple of places so you won't lose them. I will make an effort to get all my bills to my email during the next year, so that there wouldn't be so much unnecessary paper coming through mail. Of course, we have contracts etc. that I prefer having printed for multiple reasons, and also I do store postcards and letters I get for sentimental reasons - and those are quite rare as we don't really send that many paper mails anymore in this era. All in all, this declutter was somewhat easy even though I was treading it to be quite much. I'm sorry I'm not showing too much of the paper organization, but they are quite personal things and on the other hand potentially boring, so I figured we shouldn't make this post overly long. What you can gather from this one is that sort your papers rather sooner than later so it stays decent, and prefer digital copies of things whenever possible. Have you done any paper declutters recently? Let me know in the comments below! That's all for this quick post, and in the next one I'm talking about decluttering my makeup and then some. Sorry if any of you are fed up with the declutter stuff, it's only this month's theme and not something I'll be posting all the time. Also, even if I do this, I don't really mind about everybody else collecting stuff, as it doesn't affect my life at all. If you are more about the fun things, check out my Instagram @silvertigo for outfit posts and more. I'll see you in my next post!